This is a delightful story of a dour young girl raised in India by her parents and servants who are all wiped out by a cholera epidemic. She is sent to a 100-room mansion in Yorkshire in the middle of a huge moor. She discovers the entrance to a secret garden and begins to glow as her garden grows. Her nickname, Mistress Mary Quite Contrary illustrates her demeanor until the magic of the secret garden takes effect. She finds a moor boy Dickon who charms animals (foxes, crows, squirrels, etc) and teaches her the name of plants. She finds an indoor boy - an invalid born when his mother died ten years previously. Colin has accepted over the years that he is sick and spends his days in bed, throwing tantrums and searching for a hump which would indicate that his hunch, his hump was developing - he had been convinced that he would grow into a hunchback. 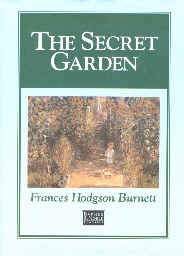 Mary begins talking to him, takes him into her confidence about the secret garden, and brings Dicken to Colin's room to meet him. Soon Colin is going down to the secret garden every day and developes a plan to surprise his father by walking to meet him when he next comes to visit. Colin also discovers the concept of magic and does experiments with it which soon convince him that there is no truth beyond magic. Colin decides to be a scientist, an explorer, and an athlete. And so the story goes, predictably unwinding and tremendously enjoyable the whole way. The magic of the author's writing is in the way she develops the story and in her natural dialogue. She has Dicken and his sister speaking broad Yorkshirese like, "Surely tha' muson know it." and dropping into English so Colin and Mary could understand them. Then Mary and Colin try their hand at Yorkshirese because they like the quick and easy way it flows across their tongue. It seems always true that cultured tongues are made to hop hurdles of precise diction and country dialects from Yorkshire to Cajun flow easily across the tongue.